In stock 330 pcs. Also available in our walk-in store. 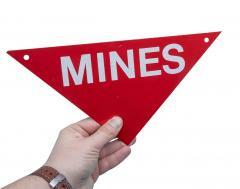 "MINES" combined with a triangular sign is something that tends to ward off any soul that seeks to enter, be it the bathroom or yard. What are you waiting for, get a bunch! A crafty person might go on and stick these in places where they definitely don't belong, like around the schoolyard or the church entrance. We didn't dare. Made of sheet steel, sides measure 29 x 20 cm, height 14 cm. On the top corners you'll find small holes for attaching this with nails, screws or cord of your choice. Real deal US government surplus. Some may be used (scratches and small dings), but a sign such as this will not exactly wear down.